The OSCE (Objective Structured Clinical Examination) is required by most medical schools now before you can take the Level 2 / Step 2 standardized patient exam. It involves less-than-life-like standardized patients with varied scripts and it can be a pain to study for. Formerly considered little more than an expensive English competency test, it now measures students ability to follow precise checklists while completing a focused H&P and have a patient-provider conversation in a short time. The standard for learning for OSCE’s is to get a physical exam prep book and read the cases. Some students will meet with a friend, torment a spouse or use Skype to practice the interaction with standardized patient, as it’s difficult to quiz yourself with the checklist in front of you. However, I recently discovered two helpful apps you might want to check out. Geeky Medics is self-described Medicine meets Mario, so of course I instantly liked them. Their 8-bit graphics make me smile, and they have a great website full of mini OSCE guides complete with video demonstrations. In January they rolled out their new app, providing some sections for free so you can test drive before you buy. Separated by section, you can focus on clinical exam, communication skills or clinical procedures. Using their website is a viable alternative, and if you have Android that looks like your only option. A clean, bright interface in a free app? Why, thank you! Again, this is a British app, but it’s “Learn, Review, Test” setup makes it useful for our purposes. Learn is a way to read all the basics, while Revise presents the steps of physical exam as flashcards, which you swipe to read. Finally, the Test tab has a checklist with a stopwatch timer (vs a countdown) so you’ll know exactly how long it takes you to get through the checklist. Simple, to the point, and a nice downtime review of OSCE steps. Much of the app is not appropriate for a second or third year US student getting through a test to prepare for Step 2 physical exam boards, so your mileage will vary. 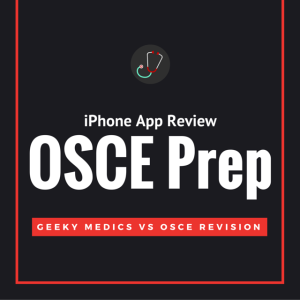 While there’s a bunch of apps to help you learn your OSCE skills, the majority of them are of very poor quality. Both of these apps seems to be designed for British medical students, so while they may help you a bit when you don’t want to carry a textbook, remember that an app is not a substitute for getting through your prep book and actually practicing!